The train was late. 75 minutes late, to be exact. I should have seen it coming, but I was hopeful. That’s the trouble with being an optimist, the possibility of being disappointed. As they say, a pessimist is never disappointed. I was heading up to Birmingham for a job interview, and had booked a ticket on Virgin Trains from London Euston station early on Tuesday morning. On Friday, a plane crash which tragically killed three people also managed to knock out power to the west-coast mainline that runs from London up to Birmingham and on to Scotland. The line was fixed by Sunday morning, but then power was disrupted again on Sunday night. By Monday afternoon, things were running again. “Trains weren’t running up to Birmingham this morning,” one of my flatmates said to me on Monday evening. “Rent a car and drive up,” I replied. “...or go up tonight,” my flatmate offered. With alternate plans in mind, I checked the web on Monday around 8. Everything was up again and running fine. In retrospect, it was the wrong plan to choose. Tuesday morning I woke up, checked the internet and was told that my train was on time. There were some problems on the line up to Rugby, but my train didn’t go through Rugby, so no problems. By the time I arrived at Euston Station, however, things had fallen apart. The time for my train to board came and went with all of the travellers still standing in the main hall. After about 15 minute an announcement came over the loudspeaker. “Attention please. Due to a fault on the line near Birmingham International station, trains to Birmingham and Manchester are currently suspended. Please remain in the main hall and wait for further information.” At the same time, the departures board changed to note every train delayed, with an indication that delays and cancellations should be expected. At that point I had another decision to make - ditch the train and find a ride, or stick with the train. I had booked my train to arrive a full 50 minutes in Birmingham before my interview, so I knew that I had some leeway in train delays, but the uncertainty of not having an arrival time was stressful. So I went with the train, leaving Euston 20 minutes behind schedule. Unfortunately, we lost time on the line as we had to wait for a long time outside of the Birmingham International station (the airport in Birmingham) for trains to get around the “rail fault,” whatever that is. 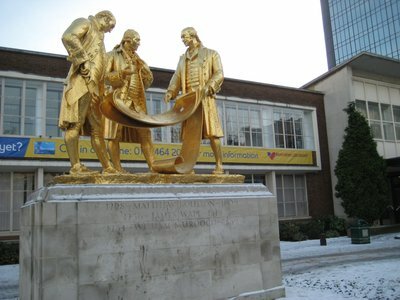 I finally arrived at Birmingham at 10:20, 20 minutes after the start of my interview. Luckily I had my interviewers number and had been able to call him and arrange to arrive late, but it wasn’t exactly the best way to settle oneself for an interview. 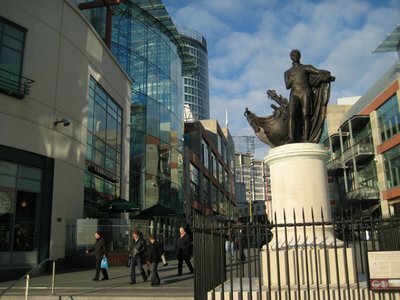 After the interview, I spent the day walking around Birmingham checking out the place and taking some photos. 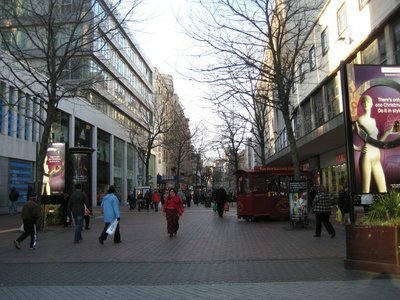 Birmingham was where my grandparents were from, so I was walking on the same streets as my ancestors. In fact, as I was wondering around I saw a man hobbling towards me that looked a lot like one of my cousins, though about 20 years older and with a goatee. At first I just waved it off as one of those strange coincidences, seeing someone far from home that reminds you of someone from back home. After I passed the man, however, it struck me that he could have looked like my cousin because he shares some of the same genes. That man could have been a relative of mine! Unfortunately he was already past me when I made this realization, and frankly I wasn't sure what I would have said to the man anyway. What would you have thought if a man came running up to you and in a strange accent said, "excuse me, do you think there is a possibility we are related?" 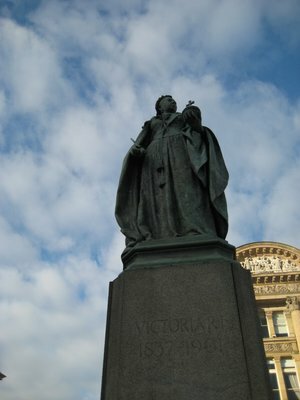 This is Victoria Square, named after the statue of Queen Victoria erected in 1901. 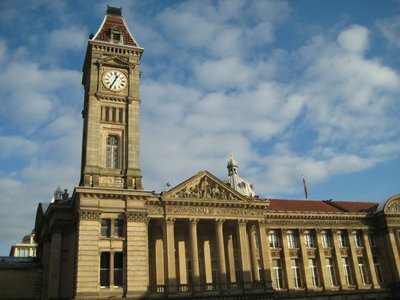 The Council House sits on one side of the square, with it's large dome and high clock tower rising up from the flat, pedestrian square. 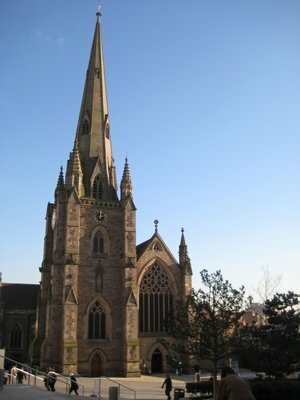 Down the road is St. Phillip's Cathedral, part of the Church of England. As you can see from the photo below, there was snow on the ground. It was about 0 C and there was a light dusting of snow. That was enough, apparently, to impact the trains, as my train back to London was cancelled due to "inclement weather conditions" along with the aforementioned rail issues. 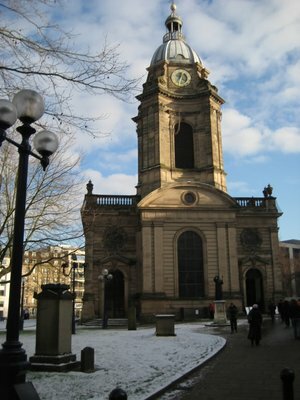 The other big church in Central Birmingham is St. Martin's, which is just outside the main train station and surrounded by modern day shopping complexes on one side and a farmer's market on the other. 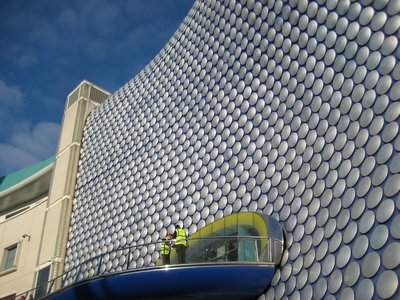 This is the Selfridges store in the Bullring complex, right beside St. Martin's. On a sunny day like the Tuesday I was there, it was quite the view to see the sun reflecting off the round bobbles on the outside of the curvy building. 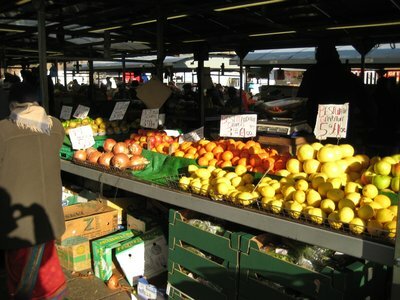 The farmer's market, on the other side of the church is loud, cramped and lively. 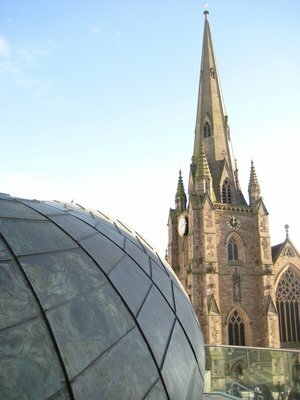 The Bullring is a shopping complex at the corner of The High Street and New Street, both which are now pedestrian shopping streets. 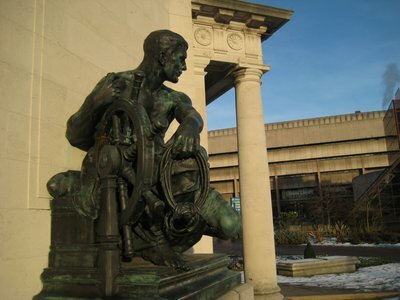 It's not all churches and shopping in Birmingham, though. There is some history. 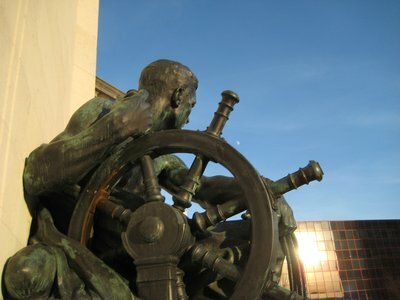 Near this statue is also The Hall of Memory. 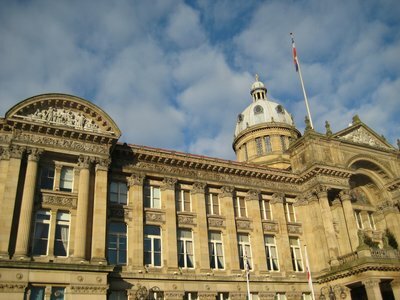 Birmingham's Hall of Memory was erected in the 1920s to commemorate the 12,320 Birmingham citizens who died in the "Great War." I must admit that the name "The Hall of Memory" made me think of 1984. It does sound like the name of one of the departments in that book, doesn't it? "Take him to the Hall of Memory, and erase his memories of this event!" 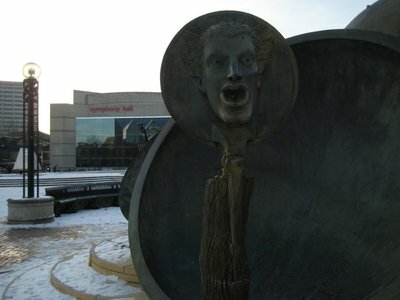 Close to the Hall of Memory is a large arts complex, including the Symphony Hall. Neville Chamberlain, Prime Minister of the UK from 1937 to 1940 was from Birmingham as well. 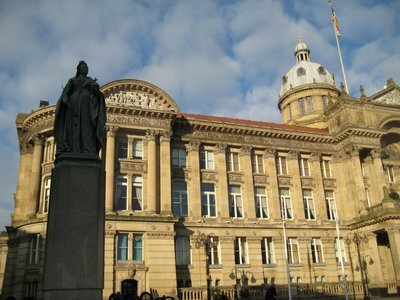 His father, Joseph was a politician as well, and was mayor of Birmingham from 1873 to 1876. 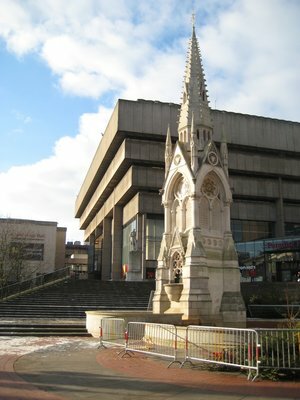 This Memorial is dedicated to his memory, and stands outside the main branch of the Birmingham Library in Chamberlain Square. Birmingham is also home of The Electric. 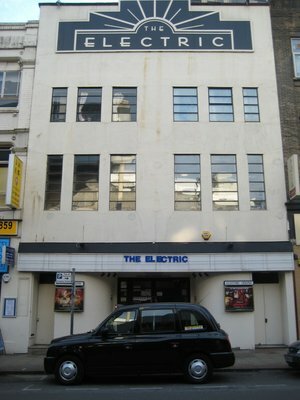 The cinema is the oldest working cinema in the UK first opening on December 27th 1909. Today it still shows films. 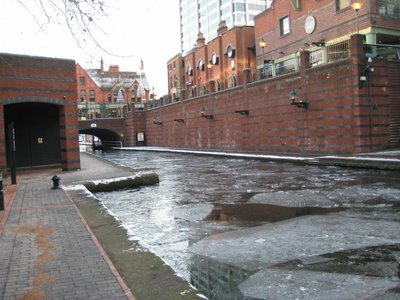 As I said, it was very cold there, and the canal through town was frozen over in some parts, and chock-a-block with ice in other. 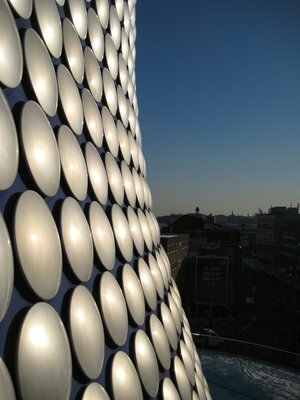 I headed back to London that evening, only spending the day in Birmingham. As I said, my train back to London was cancelled, but luckily for me (though unluckily for those who were scheduled to take the service), I was able to catch a ride back on a train that was delayed 45 minutes, and ended up leaving Birmingham a full 3 minutes before my scheduled departure. I did have to stand until Coventry, but at least I got home on a day when the trains weren't really running. Good luck on the job prospect! Birmingham looks like a lovely home base. The interview was in Birmingham, but the job will keep me based in London. Thanks to share your experience with us & also very helpful to us. Thank you Thanks a lot. Interesting. I never really thought of myself as much of an online journalist, really. Online humourist, perhaps, if those reading are feeling generous.